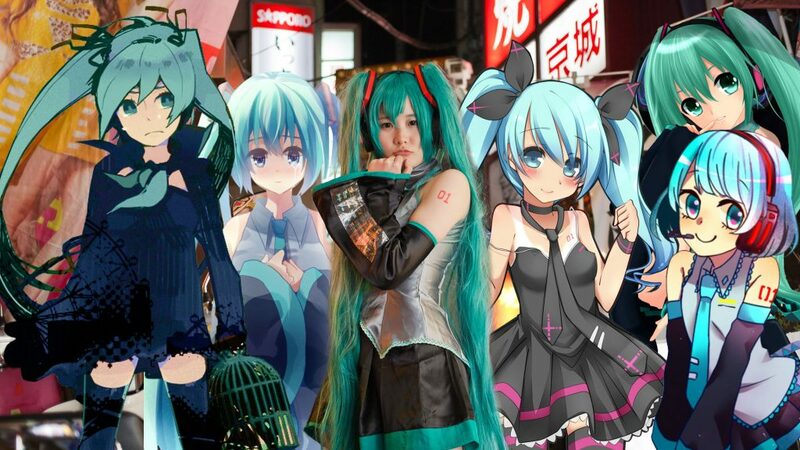 Featured in this interview is Tara Knight’s animated, episodic, documentary series of short films, Mikumentary, about the singing, dancing, and collaboratively-created hologram Hatsune Miku. Through fragmented storytelling and animation that responds to Miku as a reconfigurable subject, Knight creates a modular series that inherently resists any temptation to reveal a single, fixed, comprehensive self or truth. Instead, Miku is portrayed as a traceable subject, rendered through thousands of artistic works produced by professionals and amateurs alike. The flexible, layered, collage, and malleable aspects of Knight’s animation embodies the nature of the production and circulation of Miku. Kelly Sears: You work across many mediums: live-action, projection design, and fragmented visual spaces. Why did you choose the medium of animation for the Mikumentary? Tara Knight: How do you make a documentary about a person who never did, and never will, exist? How do you make a film about a subject that is created by hundreds and thousands of people? When I began this project, I knew that photorealistic representation could very easily reduce this complex phenomenon down to one person or a small group that makes or authors Miku. Animation—frame-by-frame drawings, compositing layers of live action, digital image manipulation—combined with a chorus of intertwined voices became a way through which I could highlight the plural, collaborative, decentralized, cross-cultural aspects of the Miku universe. KS: The animation aesthetics shift in each episode of the Mikumentary. How did this strategy evolve in this project? TK: When you watch the six Mikumentary episodes end to end, it looks like six different people could have made each of the six different films! For example, Episode 1: Everybody’s Voice collages hundreds of existing images into one visual space, whereas Episode 2 focuses on Miku’s ephemerality through layering, and re-layering her holographic concert footage into an undulating, rhythmic, non-corporeal abstraction. That was part of my challenge: each episode attempts to create a unique visual language to articulate each dimension of this phenomenon. KS: Instead of structuring Miku as one, longer documentary project, why did you choose an episodic structure for Mikumentary? TK: I intend for Mikumentary to circulate the same way my subject matter does: online, for free, short form, under Creative Commons, and allowing people to remix my films in anyway they want to. Why would you make a traditional documentary about such untraditional content? If Miku is an instance of participatory culture, like Wikipedia, like Reddit, or Imgur, or like the platform of Facebook, why not incorporate some of these aspects into the structure and distribution of the films themselves? For me, personally, this unusual format had succeeded when people within the Miku community use sections of my animation in their own films, when they remix the audio into ringtones, or bootleg subtitle these films into Spanish, Cantonese, Vietnamese, and other languages. The films have circulated in this form online, but documentary and animation festivals still operate with more conventional programming models. I’ve retroactively made a more traditional “screening friendly” version so that this work can reach more audiences. Tara Knight is a filmmaker, animator, and media designer for live performance. Her Mikumentary films have screened in excerpts at institutions ranging from pop culture to fine arts: New York Comic Con, South By Southwest Interactive Festival panel, and at the Mori Art Museum in Tokyo, among others. Knight is an Associate Professor of Critical Media Practices at the University of Colorado, Boulder.